(trakt), [TA] Do not confuse this word with track. 1. An elongated area; a passage or pathway. 2. An abnormal passage (for example, a fistula or sinus communicating with an abscess cavity). 1. a region, principally one of some length. 2. a bundle of nerve fibers having a common origin, function, and termination. 3. a number of organs, arranged in series and serving a common function. alimentary tract see under canal. atriohisian tracts myocardial fibers that bypass the physiologic delay of the atrioventricular node and connect the atrium directly to the bundle of His, allowing preexcitation of the ventricle. 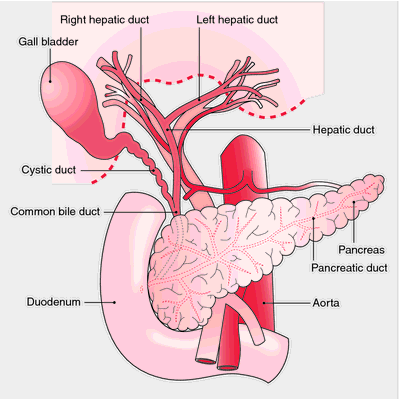 biliary tract the organs, ducts, etc., participating in secretion (the liver), storage (the gallbladder), and delivery (hepatic and bile ducts) of bile into the duodenum. extracorticospinal tract , extrapyramidal tract extrapyramidal system. 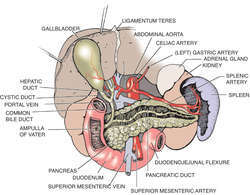 Flechsig's tract posterior spinocerebellar t.
gastrointestinal tract the stomach and intestine in continuity. Gowers' tract anterior spinocerebellar t.
intestinal tract the small and large intestines in continuity. nigrostriatal tract a bundle of nerve fibers extending from the substantia nigra to the globus pallidus and putamen in the corpus striatum; injury to it may be a cause of parkinsonism. pyramidal tract two groups of nerve fibers arising in the brain and passing down through the spinal cord to motor cells in the anterior horns. respiratory tract see under system. reticulospinal tract a group of fibers arising mostly from the reticular formation of the pons and medulla oblongata; chiefly homolateral, the fibers descend in the ventral and lateral funiculi to most levels of the spinal cord. spinocerebellar tract, anterior a group of nerve fibers in the lateral funiculus of the spinal cord, arising mostly in the gray matter of the opposite side, and ascending to the cerebellum through the superior cerebellar peduncle. spinocerebellar tract, posterior a group of nerve fibers in the lateral funiculus of the spinal cord, arising mostly from the nucleus thoracicus, and ascending to the cerebellum through the inferior cerebellar peduncle. spinothalamic tract a group of nerve fibers in the lateral funiculus of the spinal cord that arise in the opposite gray matter and ascend to the thalamus, carrying the sensory impulses activated by pain and temperature. 2. sometimes more specifically the conduits leading from the pelvis of the kidneys to the urinary meatus. urogenital tract see under system. 1 an elongated group of tissues and organs that function together as a pathway, such as the digestive tract or the respiratory tract. 2 (in neurology) the neuronal axons that are grouped together to form a pathway; a serial arrangement that serves a common function. 1. A bundle of nerve fibers in the CNS. See Spinothalamic tract. 2. A tube through which a substance or gas flows. See Aerodigestive tract, Biliary tract, Gastrointestinal tract, Olfactory tract, Respiratory tract, Serpiginous tract, Urogenital. An elongated area, e.g., path, track, way. 1. An associated group of organs forming a pathway along which liquids, solids or gases are moved. Examples are the digestive tract, the urinary tract and the respiratory tract. 2. A bundle of myelinated nerve fibres with a common function. a bundle of nerve fibres that may run within the CENTRAL NERVOUS SYSTEM or to the peripheral nervous system. 1. A bundle of nerve fibres (e.g. the optic tracts). 2. A system of organs serving the same function, e.g. the respiratory tract. geniculocalcarine tract See optic radiations. optic tract's Two cylindrical bands of nerve fibres carrying visual impulses. They run outward and backward from the posterolateral angle of the optic chiasma, then sweep laterally, encircling the hypothalamus posteriorly on their way to the lateral geniculate bodies. A few fibres end in the superior colliculi. See incongruous hemianopia; visual pathway. 1. Elongated area; passage or pathway. 2. Abnormal passage (e.g., a fistula or sinus communicating with an abscess cavity). a longitudinal assemblage of tissues or organs, especially a bundle of nerve fibers having a common origin, function and termination, or a number of anatomical structures arranged in series and serving a common function. For anatomically specific tracts see under their identifying titles, e.g. alimentary, respiratory.